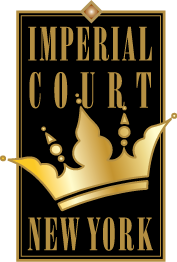 reetings from the Imperial Court of New York, and welcome to our fabulous world of Court Royalty with a twist. We embrace diversity and inclusion at all levels. We take our special talents and passions for fashion and performance artistry and employ them to raise money, awareness, and consciousness in support of direct services organizations that positively affect the LGBTQ community. We have been instrumental in supporting HIV/AIDS services and research. We have helped countless underprivileged youth and shelters. We have empowered and educated through diversity programs. We have made—and continue to make—a difference!